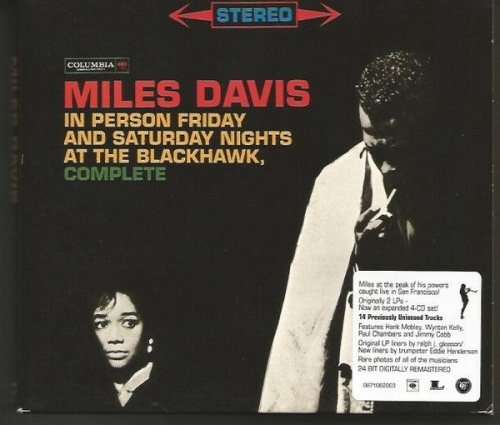 The Legacy imprint's issuance of the complete performances of the Miles Davis Quintet at San Francisco's (infamous) Blackhawk in April of 1961 sets straight a very confusing record once and for all. The individual nights have been available in many different configurations over the decades, first as LPs, and in even weirder ones on CD. That's all over now, as this pair of double discs contain both nights in their entirety, adding a total of four previously unreleased performances to Friday night and nine unissued performances to Saturday night, including an entire unreleased fourth set. This alone is reason to purchase the four-CD package, though both evenings are available individually as well. In terms of which night of the two was better, it's a toss-up. This short-lived version of the quintet featured Paul Chambers, Wynton Kelly, Jimmy Cobb, and Hank Mobley with Davis. These four discs should begin to fill the void of criticism about this band. Though short-lived, the unique character of this group was its sheer intensity and diversity of attack. Because of the departure of Cannonball Adderley and John Coltrane, Davis had to rely as much on a muscular attack in playing his instrument as his considerable gift for melodic improvisation. For his part, Mobley had the shoes of two monster players to fill, and he does so elegantly with a ton of fire in his playing. But it is Kelly and Chambers who really set the pace for this band. Kelly fills space in the middle register with an amazingly percussive attack that is as rhythmic as it is harmonically inventive. Mobley steps away from the hard bop side of his trademark sound to go back to the Sonny Rollins book of bebop, and even Davis uses the method of attack and surprise that gained him a reputation with Charlie Parker. Chambers is the man on whom it all turns, equating the parts of the band's aesthetic. He and Cobb move toward one another and Chambers translates the shifting rhythmic patterns and segues to Kelly, whose interplay with him is almost instinctual, and then through Kelly to the horn players. Kelly's sense of that ever-changing momentum and dynamic allows him to be a real part of the rhythm section (as opposed to a melodic counterpart to the front line) and adds room for the horn players to move about inside the bridges he creates between the two factions. His right-hand soloing is based on a series of harmonic and intervallic modes he continually pulls out of his hat and feeds Chambers, more in terms of directional possibility, which is vertical rather than horizontal. For evidence, check the contrast between the opening tunes: Friday's "Oleo" at breakneck speed, and the nearly 13-minute "If I Were a Bell" on Saturday, which lopes and takes its time articulating the varying chromatic architectures being erected not only during the solos, but in the band's ensemble playing as well. The common tunes from both nights -- such as "If I Were a Bell," "Walkin'," "On Green Dolphin Street," "No Blues," and "Love, I've Found You" -- differ radically from one another. On Friday everything is pent-up; chops are flying off the bandstand furiously, with each player holding tight to Miles' arrangements, but forcing the issue of the solos. On Saturday, the set is relaxed, uptempo in most cases, and filled with a kind of comfort that allows for chances to be taken without consequences. The reading of "Autumn Leaves" and the unique version of Thelonious Monk's "Well, You Needn't" provide an astonishing look at bandmembers who could pull off virtually anything, although they had only been together a short time. Add the set of ballads on Saturday -- "I Thought About You," "Someday My Prince Will Come," and "Softly, As in a Morning Sunrise" -- that closes out the weekend, and the listener perhaps hears as many dimensions to Miles Davis as existed at the time. The sound is pristine; the packaging is lovely, with new notes by Eddie Henderson that accompany Ralph J. Gleason's original ones. Complete documentation accompanies each disc, and no Davis fan should be without these recordings purchased separately or as a set.